I’ve been knitting on Decimal quite a bit this week, but I’ve been taking breaks occasionally and knitting on the two socks I’m working on. 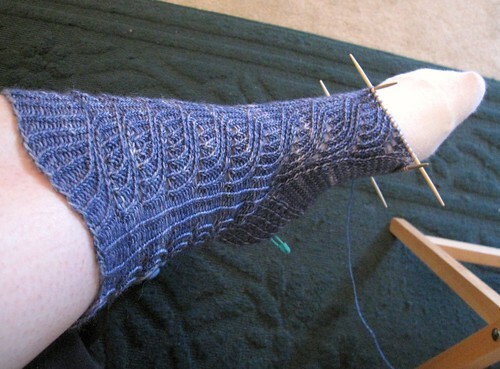 At first I was knitting more on the stripey Vesper socks because I wasn’t sure how much I liked Marlene. I had tried it on early in the week and just felt “meh” about it. I was considering ripping it out then decided I should let it sit for a few days before deciding. Today I put it back on and decided it’s a keeper. I wasn’t sure how I felt about the fit. I was worried that it was a little loose and not quite right. I was really close to ripping it out! Glad I decided to let it sit for a few days and see how I feel. 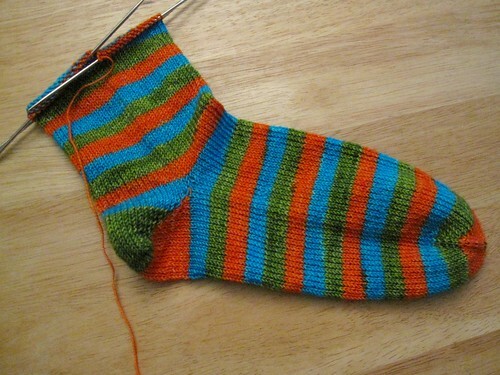 While Marlene waited my decision, I knit quite a bit on the stripey Vesper sock. Monday I turned the heel and I’m getting close to the ribbing now. Since my sock books arrived on Tuesday, I’ve been itching to start another pair. I just kept flipping through the books trying to decided on one to start, but finally decided that I should finish one of the pairs I’m working on before starting a new one. The books sit fairly close to me, though, so I’ve been taking breaks and looking through the books. Good thing for the above socks that I’m indecisive and can’t settle on a pattern! 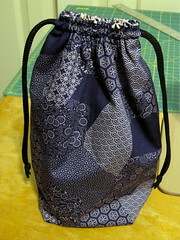 I was going to blog about this on Monday, then I was waiting to finish the last one I’d cut fabric for, but I don’t know when I’ll get to that last one… so here are the project bags I spent some time sewing on Monday. 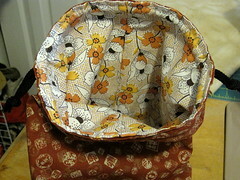 The third one I made is a box bag. 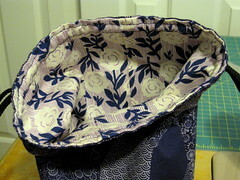 I have fabric cut for a fourth one, but I haven’t sewn it up yet. 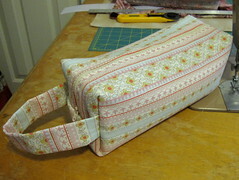 All the sewing was fun to do, but now I have so many project bags I don’t know what to do with them all! 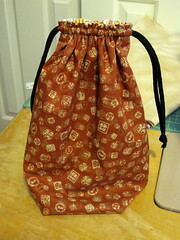 I think the box bags are my favorite, though they do take a bit more time to make. I really like the socks, but I really like the bags. You are so creative. 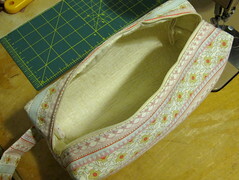 I wish I could sew, that is one thing I could never get the hang of. My mother was a creative genius when she was at her sewing machine. I must not have inherited that trait. The socks are wonderful. The project bags are great and I am so glad to hear that your recovery is going well! i can see why you were contemplating ripping marlene. not becuase of your skills….those twisted stitches makes socks feel a lil uncomfortable for me. but i have to say they look great! !